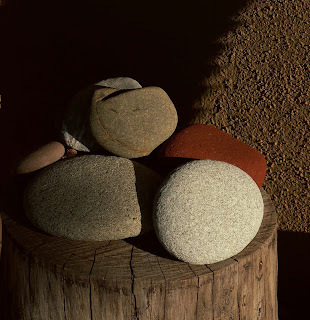 “Rocks in still life, early morning” by cobalt123. Nowadays, I’m nervous. My friend lost her home, my brother-in-law lost his job, and I know we’re just a stone’s throw away from their situations. Trying to keep my jittery nerves in check isn’t easy. I plumb websites like The Simple Dollar for tips on frugal living. I listen to public radio’s Marketplace regularly for its excellent economic news. I’m trying to beef up my resume after 10 years of mommyhood. And I cook more soup. “Worries go down better with soup.” — A Jewish proverb. Do you remember the story “Stone Soup”? The gist of it is this: Once upon a time some tired soldiers straggled home to a village empty-handed, in a land destroyed by war. They were hungry, but the villagers didn’t think they had food to share, and slammed their doors. The soldiers pulled out a big pot, filled it with water and put it on a fire to boil. Then they added a large stone to the pot. The villagers peeked out of their doors. “What kind of soup is that?” they asked. “Well, I have that,” grumbled one old woman, coming out with a shriveled onion and tossing it into the pot. And so, one vegetable at a time, the villagers added food to the pot, and everyone feasted. During the Great Depression, people placed a large, porous rock in the bottom of their soup pots. On days when they had food, they believed the stone absorbed some of the flavor from the soup. On days when there was no food, they boiled the stone, releasing flavors and making a weak broth. Nowadays, there are groups of friends who make soup together, always with a small stone at the bottom of the pot. The person who finds the stone at the bottom of her bowl plans the next soup gathering. “A soup like this is not the work of one man. It is the result of a constantly refined tradition. 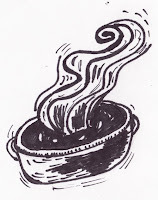 As I poured over cookbooks for tasty bowls of soup, a plan simmered. As I counted the people lining up at the doors of a neighborhood church to receive free groceries, a plan simmered. As I thought about that fable of cooperation amid scarcity, a plan simmered. As I reminded myself how fortunate I was to have a steady income, a warm home and a pot of soup on the stove, a plan simmered. Firstly, I’m going to cook more soup. Sometimes I’ll take a picture of the soup and share the recipe with you. Secondly, I’m going to buy twice the ingredients needed for my soups in order to regularly donate half of it to the church down the street. Soothing. Simple. Sustenance. Sharing. Stone soup. Fry bacon until lightly browned. Add onion and carrots, and saute until soft. Add garlic and oregano and cook for a few more minutes. Stir in tomato paste, add broth and beans and bring to boil. Lower heat, toss in the Parmesan rind (loaded with umami) and simmer. Add the spinach shortly before serving and cook until it is wilted but still bright green. Season to taste with salt and pepper and ladle into your bowl. And don’t forget to fish out the Parmesan rind and set it aside for your next soup!